Tripura CM Biplab Kumar Deb's tweet. Controversy never seems to elude Tripura chief minister Biplab Kumar Deb. Be it internet, Mahabharata or beauty, the gym trainer turned chief minister courted controversy again. 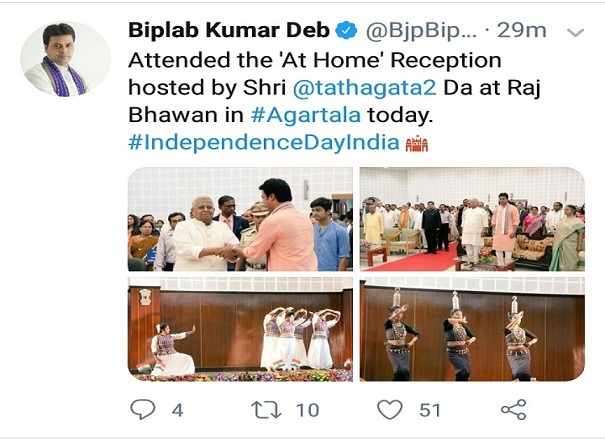 This time, it is his tweet after attending the ‘At Home’ reception hosted by Tripura governor that generated controversy. Breaking the protocol, the Tripura CM addressed Governor Tathagata Roy as ‘Tathagata Da’ (Da in Bengali means elder brother). “Attended the ‘At Home’ Reception hosted by Shri @tathagata2 Da at Raj Bhawan in #Agartala today,” Deb tweeted. Protocol says the Chief Minister should always address the Governor as ‘Honourable Governor’ and not ‘da’ or anything else as addressed by the Tripura chief minister. Deb, a greenhorn politician, probably forgot to maintain protocol because of his inexperience and addressed the governor saying ‘Da’ instead of ‘Honourable’. On the other hand, BJP chief minister of Arunachal Pradesh Pema Khandu, has addressed the governor maintaining the protocol. “Attended ‘At Home’ hosted by Hon’ble Guv Brig (Dr) BD Mishra Ji (retd) this afternoon on occasion of #IndependenceDayIndia at Raj Bhawan. 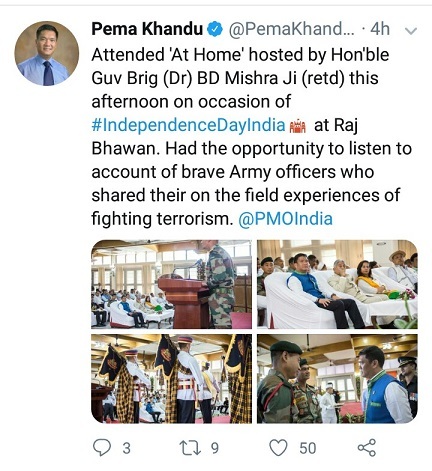 Had the opportunity to listen to account of brave Army officers who shared their on the field experiences of fighting terrorism,” tweeted Khandu. Khandu is new to BJP, but being a veteran RSS, Biplab Kumar Deb’s regimentation should have taught him to be more disciplined.